» Archived Mystery.File Review: BENJAMIN WOLFF – Hyde and Seek. 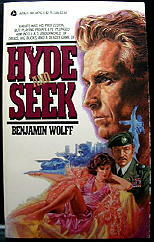 Archived Mystery.File Review: BENJAMIN WOLFF – Hyde and Seek. BENJAMIN WOLFF – Hyde and Seek. Avon, paperback original; 1st printing, October 1984. I hate to disagreed with Mr. Hillerman, but I do. I thought the story was murkily plotted, that Wolff is an unpolished story-teller, and that while I personally didn’t go wild over it, maybe the book did sell well in army post bookstores. Not that it’s in Donald Pendleton’s league, but when it comes down to it, whose are? From the publicity blurb on the front cover, I was also led to believe that this was a private eye yarn. As it turns out, though, the only real connection the protagonist of the story, John Byron Hyde, has with that profession is through a part-time job he has doing an insurance investigator’s books. He is also a part-time karate instructor, however, and a disillusioned post-traumatized Vietnam vet, and (after some thought) nobody I’d really rather care to know. (There goes the rooting interest.) When he’s asked by a girl (a knockout, of course) to help her find her brother, who’s mysteriously disappeared, he ends up in a sour-tasting melange of drug smuggling, South American politics, and the semi-benevolent order of The Good Helpers of our Lady The Mother of God. After something of a conclusion has taken place (at least everybody’s motivations are laid out in the open), the story is clearly continued into the next volume of Mr. Hyde’s adventures. I have a copy — it’s here somewhere– but if/when I find it, the question is, will I read it? You have two guesses, the same as I, and the second doesn’t count. � From Mystery.File 1, January 1987 (revised). [UPDATE] 12-11-08. An uneasiness I have whenever I pull a review out of my archives that’s as negative as this one is that it turns out to have been written by someone I know, but writing under a pen name at the time. Not that I fear writing negative reviews (not all books can be as wonderful as the publicity guys make them sound), but generally speaking, I tend not to write reviews of books by authors I know. It turns out that Wolff was a pen name, and that there were only two of John Hyde’s adventures. My review had nothing to do with the latter. No more than 40 people may have seen this review when it first appeared; more than likely it was only a tenth of that. WOLFF, BENJAMIN. Pseudonym of Louis Chunovic; see also Charles Heath. Operation Desert Sun: The Untold Story [by Louis Chunovic] (Dell, 1984, pb) [A-Team; Middle East]. Novelization of the �A-Team� TV series.